Last weekend I was in charge of a bird-watching (aka “birding”) field trip to the Outer Banks of North Carolina. The 100 participants ranged in age from 12 to 92. Talk about diversity! Often when preteens or teens attend, they’re accompanying parents who are eager to introduce them to the world of birds. In this instance, two 12 year-old boys brought their mothers along. I knew one of the boys, Ned, because he’s a member of our local bird club. He’s been an avid birder for two years and has accompanied my husband Lee and me for Audubon bird counts. Ned is not like most boys his age. As I watched him in action over the weekend, I was awed by his maturity and the personal strengths he exhibited. Ned doesn't use binoculars to look at birds. 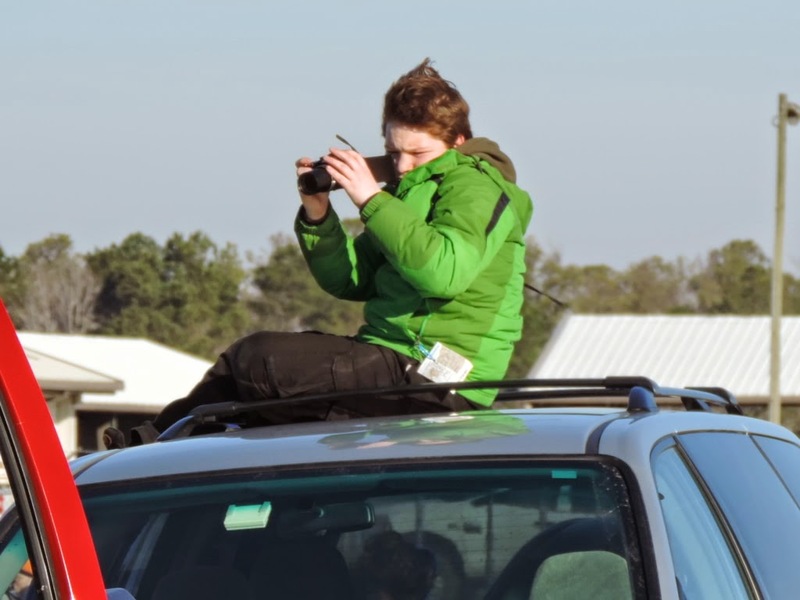 While this is a must-have piece of equipment for most birders, Ned uses his camera exclusively. He’s taught himself to expertly zoom in and out to view a bird and take a picture at the same time. Pretty ingenious. I've never seen anyone else do that. People who are serious birders keep a list of birds they've seen. When they encounter a new species, they call it a “life bird.” Some folks count birds that they barely see because they’re eager to add to their numbers. Not Ned. He holds himself to a very high standard. He only counts birds that he can photograph. He wants documented proof that he’s seen a specific species. As handy as he is with his camera, he’s been able to get a shot of almost every new species he encounters. The host hotel offered a hot breakfast every morning, starting at 6:00AM. My husband Lee and I arrived at 6:10 both days. Ned was already there, by himself (his mother and buddy slept in), finishing up his morning meal. No one had to prod this kid to get up. He wanted to make the most of his time, so he arrived at the earliest possible moment. After clearing his table off, he scurried out the door to stand on the large deck just outside the breakfast room, looking for birds and capturing pictures of the sunrise. Unlike many kids who have the attention span of a gnat, Ned was able to be still for long periods at a time and just WAIT. Whether he was sitting on a bench waiting for the sunrise or out in the field waiting for birds to show up, he seemed to just enjoy the moment and relish in whatever came next. Because of the number of attendees, we divided into smaller groups for the field trips. No matter which group Ned was in, he brought an infectious enthusiasm that spread to others. This young man LOVES birding. He’d rather do that than almost anything else. You won’t see him with any electronic gadgets, playing video games or texting his friends. When we’d mention species that we might see on a particular trip and it was a new bird for him, Ned’s excited face lit up the room. Yes, Ned left quite an impression on everyone, a very positive impression. You might say he was a phenomenon. He certainly inspired me to appreciate the beauty around me - and life in general - in a more profound way.